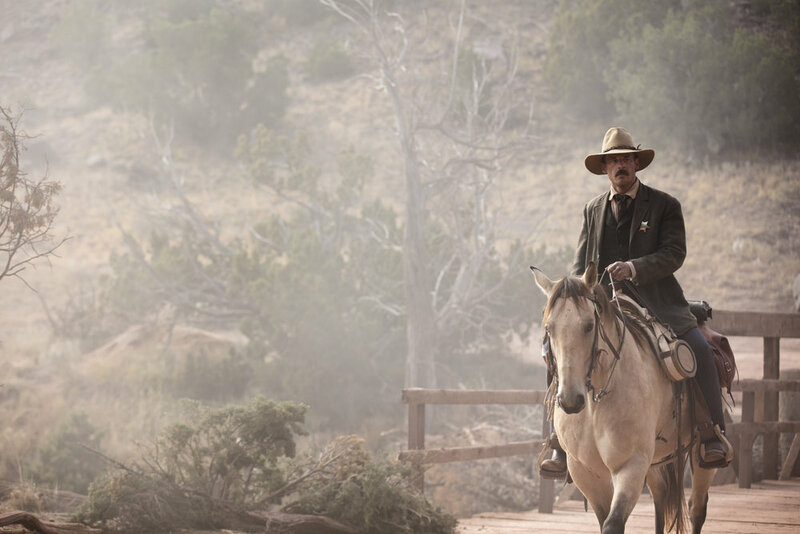 Godless is a violent western that subverts one particular stigma of westerns: it stars a lot of strong-willed women in a town whose male population is largely eliminated before the beginning of the series. While there are several main male characters, the narrative makes an effort over seven episodes to simultaneously tell the male and female sides of the story. Other than this unique opening of gender roles in the often male-dominated Western landscape, Godless just tells a damn good Western outlaw story, with a great cast, and a framing and score that imply the miniseries could easily be watched as an extended film. 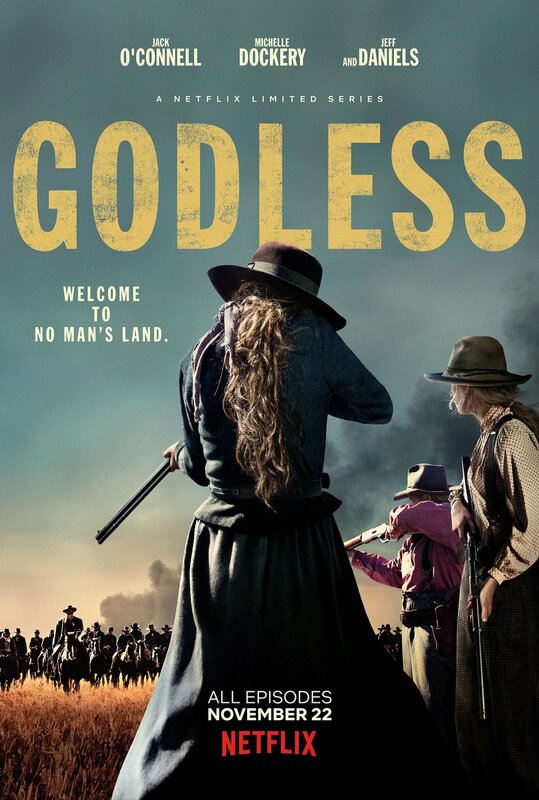 The line between series and cinema has blurred in recent years, with several of the best television series often transcending the best films, and while I don't think Godless is quite among the best series of recent memory, it's still a solid miniseries that any Western fan should enjoy. The narrative of Godless tells the story of family-turned-enemies, Frank Griffin and Roy Goode. The former leads a band of outlaws across the countryside, and the latter decides to leave the gang, and is hunted for it. Along the way, Roy runs to the outskirts of the town of La Belle, and meets Alice Fletcher, the owner of a ranch far outside of town, who tends to his wounds and helps him back on his feet before the inevitable confrontation with the outlaws he is trying to escape from. Other supporting characters include Bill McNue, the sheriff of La Belle who seeks redemption, Mary Agnes McNue, the headstrong lesbian sister of the sheriff and a protective matriarch in her own rash ways, and Whitey Winn, the naive but ultimately noble-hearted deputy who looks after the town while Sheriff McNue is away. The cast all does a fantastic job of helping the narrative remain grounded, with the different members of the town all feeling like they are given character depth despite this only being a seven episode miniseries. The story of the town is arguably as tragic as the story of Frank and Roy, and these two stories parallel until the ultimate climactic collision of the finale. The series is incredibly violent, reveling in shootouts, duels and general forms of cowboy action, but the violence always feels earned rather than obligatory, which is something I felt diminished the early seasons of rival Western series Hell on Wheels. 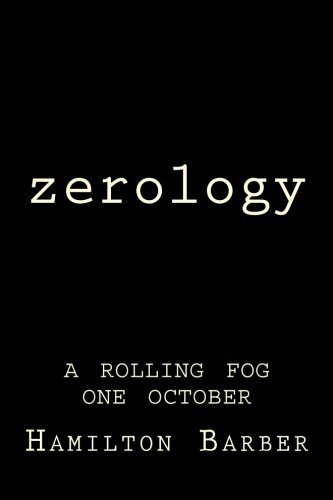 Overall, the series has an excellent beginning and a thrilling conclusion, though a couple episodes here and there are necessary slow-burns to help build up the tension and character development, particularly in the characters I have mentioned by name up above. 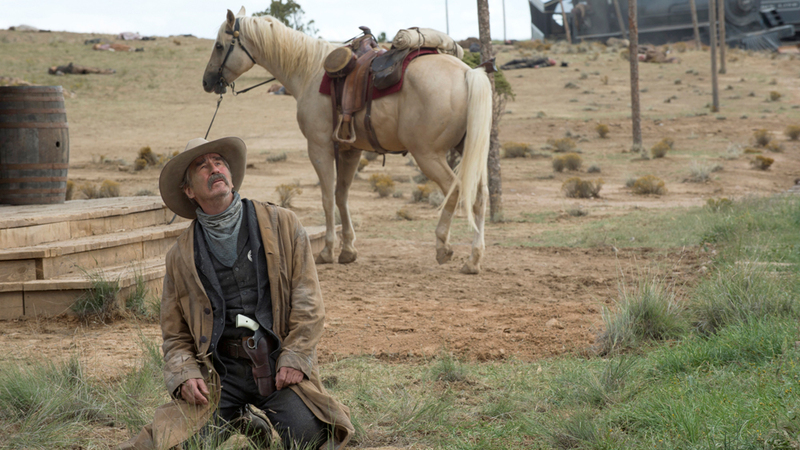 The acting presented in Godless is all great amongst the whole cast, but Jeff Daniels steals the series as Frank Griffin. A villain who is given more depth in subsequent episodes than his intimidating, malevolent Luciferian prescence suggests in the pilot, Daniels eschews the most nihilistic bits of dialogue, along with Biblical allusions and other intimidating soliloquys the likes of which will no doubt help usher him in to a place in Western villain history. Jack O'Connell is a good standard Western hero as Roy Goode, and he shows some range that could only really be justified via series length. Michelle Dockery has a firm strength and never feels like a damsel in distress as Alice Fletcher. Scoot McNairy plays a more restrained and subdued role, but it's a role he's so good at: a conflicted, but morally sound lawman. Merrit Wever plays perhaps one of the more masculine characters, and she performs with gusto. Finally, Thomas Brodie-Sangster's Whitey proves to be the heart of the series, as he remains likable, and his arc proves to be one of the more investing ones in the whole series. From an acting standpoint, I have no complaints, other than the fact that Jeff Daniels so excellently eats up every scene from each character he interacts with, and his skill at acting far outweighs the other members of the cast. The cinematography and score are highly cinematic for a television miniseries, but this is to be expected, given Netflix's willingness to provide great budgets for their original programming. Scott Frank created the series, and he wrote and directed every single episode, which provides a kind of artistic consistency in composition that has only recently taken off thanks to the likes of fellow miniseries like True Detective and the third season revival for Twin Peaks. This is probably his best singular work, without counting works he had co-writing credit on, such as Logan. It's incredibly easy to see, with the violence, camerawork and performances on screen, that Frank wanted to portray Godless as a kind of seven to eight hour film rather than a series, and this helps separate the show from comparisons like Deadwood. It's a relatively familiar beast but it is nonetheless entertaining to observe. Godless does not reinvent the wheel when it comes to western drama, but it works the wheel incredibly effectively. The actors present, particularly Jeff Daniels, help to elevate the composition and familiar territory, as does the screenplay that presents the story of the town of La Belle. The female focus that the screenplay makes sure to relay along with the masculine dueling outlaw narrative helps to give the story a sense of freshness beneath the recognizable western exterior. Stream it on Netflix if you feel so inclined.